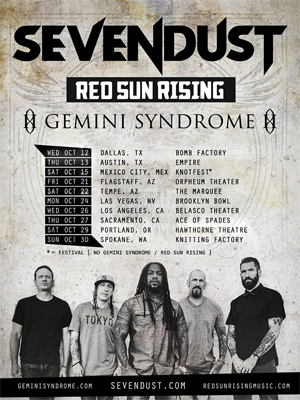 Los Angeles based rock outfit GEMINI SYNDROME have announced a new batch of US tour dates alongside SEVENDUST and RED SUN RISING. The West Coast run starts on October 12th in Dallas, TX and concludes in Spokane, WA on October 30th. GEMINI SYNDROME is currently out on their "Remember We Die" headlining tour supporting the band's new album, Memento Mori, which was release last Friday (Aug. 19) on Another Century. "We are more than excited to be touring with our brothers in SEVENDUST again this fall. A great band, a great lineup, and great people. Come out and make this community bigger and better than it ever has been. The time is now." A complete list of tour dates for GEMINI SYNDROME can be found below.